Rural producers in communities in the Ocotepeque department face multiple challenges to enter markets and improve income levels such as no access to credit and outdated farming methods. Asociación del Trifinio para el Desarollo Sostenible (ATRIDEST) works with farmers using field schools to apply sustainable production strategies and with local community savings and loan organizations to improve collective marketing and access to credit. 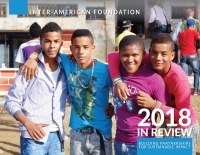 At the IAF, we support community-led solutions to expand economic opportunity in Honduras. ATRIDEST’s activities promote smallholder agriculture and market development to enhance food security and ensure meaningful opportunities for communities to thrive.